Bold Blind Beauty believes when a person feels good they look good. We believe in celebrating what we have and working it to the best of our ability. When we begin with a beautiful heart, our appearance reflects what’s on the inside. Every time we leave our home we are presenting ourselves to the audience in the world around us. Putting our best foot forward can bring about many opportunities for employment, friendship or love to name a few. The added bonus? We feel like a million bucks. When we are well put together and people see us confidently strolling down the street with our white canes they’re going to stare. As Harry Winston once said, “People will stare. Make it worth their while.” Carry on ladies! 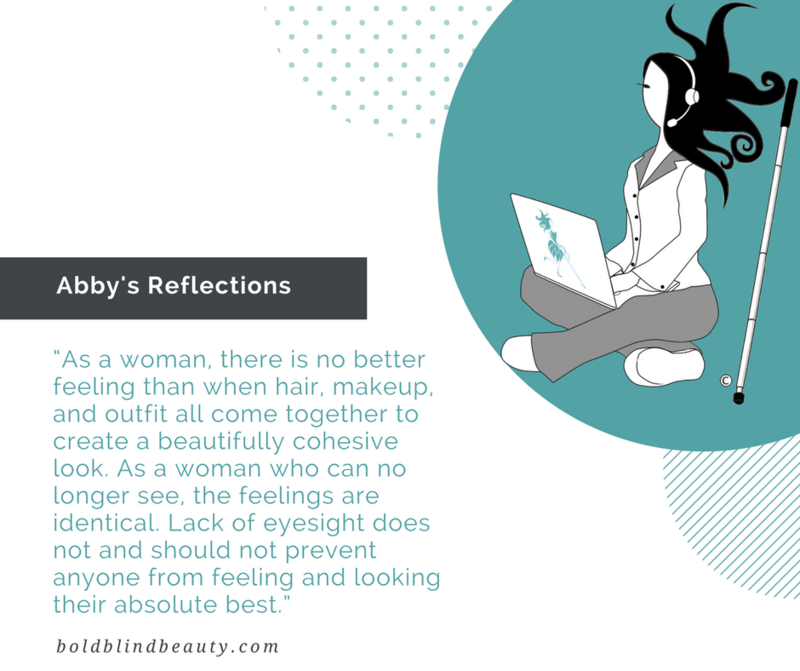 A white, teal and gray boldblindbeauty.com template uses the ‘Abby’s Corner’ image of Abby sitting cross-legged in her PJs. Her PJ bottoms are gray, her top is white with a gray collar. A laptop with a teal Abby logo is on her lap. Sporting her signature explosive hairstyle, she is wearing a headset with microphone and her white cane is propped up next to her. When we begin with a beautiful heart, our appearance reflects what’s on the inside. I love that!